In Argentina, on the 29th of the month, the tradition is to make gnocchi, Los Ñoquis del 29. There are a few stories to explain the origins of this tradition but, regardless, it is a nice excuse to get together with friends and family. 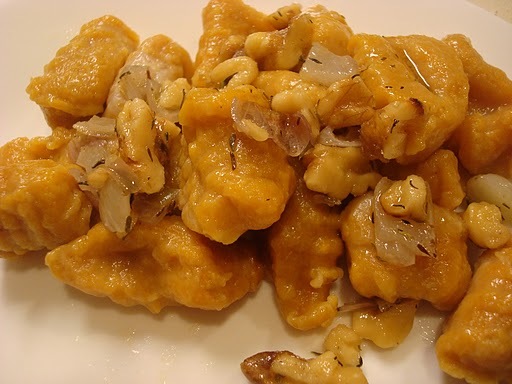 Last month, when Juan’s mom told me about this tradition, I made Pumpkin Gnocchi. We served them with a brown butter-shallot-walnut sauce. The recipe could be easily adapted for any leftover pumpkin from Thanksgiving. Enjoy! Mix all the ingredients together. Roll the gnocchi (add more flour if necessary) and boil until they rise to the top of pot. P.S. Also, Check out my Ricotta Gnocchi Recipe. While you are at it, check out my latest giveaway! Yum,now I know what to do with some of my pumpkins.This look really good.I came across your site from the foodieblogroll and I’d love to guide Foodista readers to your site. I hope you could add this pumpkin widget at the end of this post so we could add you in our list of food bloggers who blogged about pumpkins,Thanks!